Many of my hikes are solo hikes, but on occasion my friend Tim has joined me. Since this was the hike to the Eastern Terminus of the FLT he decided to come along. 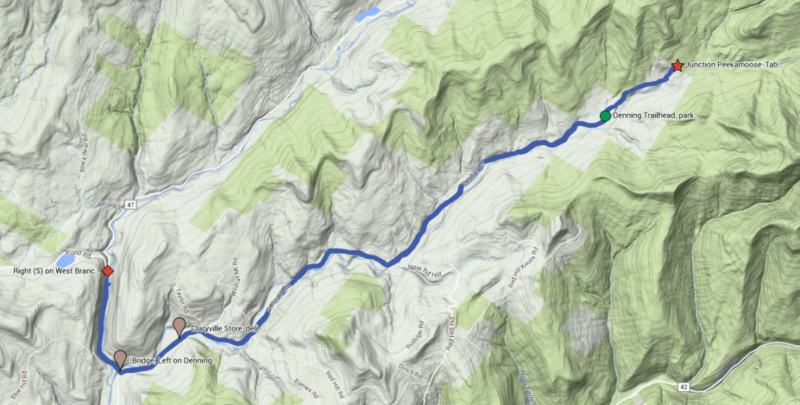 In comparison to many of my hikes this one might not seem very “interesting” at first look. The hike was nearly all road walk, 19 miles of road and 2.6 miles of trail. It was also a very flat hike since it was mostly road; the total ascent was only 652 feet over nearly 22 miles, but even long flat road walks can offer some good photo opportunities. We loaded all of our hiking supplies into the car shortly after dawn. It was chilly and I could see my breath; the temperature was only in the upper 30s. We had a nearly two hour drive to the parking area at the Denning trailhead. We decided to tackle the road walk portion first and would wear sneakers for that long section. Once we completed the road walk we would change into our boots and finish the remaining trail section. After a long drive on the highway we turned off on to smaller country roads. We soon came to Denning Road and the small town of Claryville. At the end of Denning Road was the trailhead and parking area. As we neared the Town of Denning town hall we were brought to a stop by police and fire crews. The road ahead was closed due to an accident – apparently a car had gone off the road at the bridge and into the small stream. We chatted with the police officer for a few minutes. He was not sure how long we would have to wait and suggested that we might look for another route. We told him that we were going hiking and needed to get to the parking area at the end of the road. We pulled to the side of the road to wait for the accident to be cleared. After about 30 minutes the officer told us it was all clear and we could proceed. We arrived at the parking area at 9:20 am. There were already several cars parked there. It was still chilly, but the sun was up and it promised to be a nice day. The sky was a bright blue without a cloud in sight. 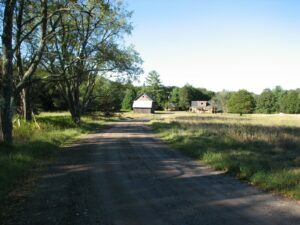 After getting our packs settled we started down the dirt road that led away from the parking area and back to Claryville – the same one we had just driven up. Our walk took us out into open sunny areas that were warming in the sunlight and back into shaded areas under the trees that were still chilly. The road changed from dirt to pavement and we continue to head down the road toward Claryville. We crossed over the Neversink river for the first time. It was really more of a stream, probably no more than two or three feet deep at its deepest point. (mile 5.2 – 11:07 am) . Shortly after crossing the bridge a field opened up to our left. As we passed through a small copse of trees we saw a barn sitting back in the shadows (mile 5.4 – 11:11 am). The contrast of light and dark along with the dark red of the barn made for a great photo. We stopped for a few minutes to take some pictures before moving on. We again crossed over the Neversink river (mile 6.1 – 11:32 am) and continued to wind our way down the road. We passed a smattering of houses and farms as we continue to walk. The road passed in and out of shaded areas and fields opened up on either side of us before falling away back into woods. We arrived at the site of the car accident and another bridge across the Neversink river (mile 6.8 – 11:44 am). The accident was now cleared, but we could see marks on the ground near the edge of the stream where the car had gone in. It was fortunate that the drop from the road to the streambed was only about 10 or 20 feet and that the stream was not very deep. We were not exactly sure how the driver had ended up off the road and in the stream, perhaps it was foggy and they had missed the turn in the road or maybe there was an animal in the road and they had swerved. 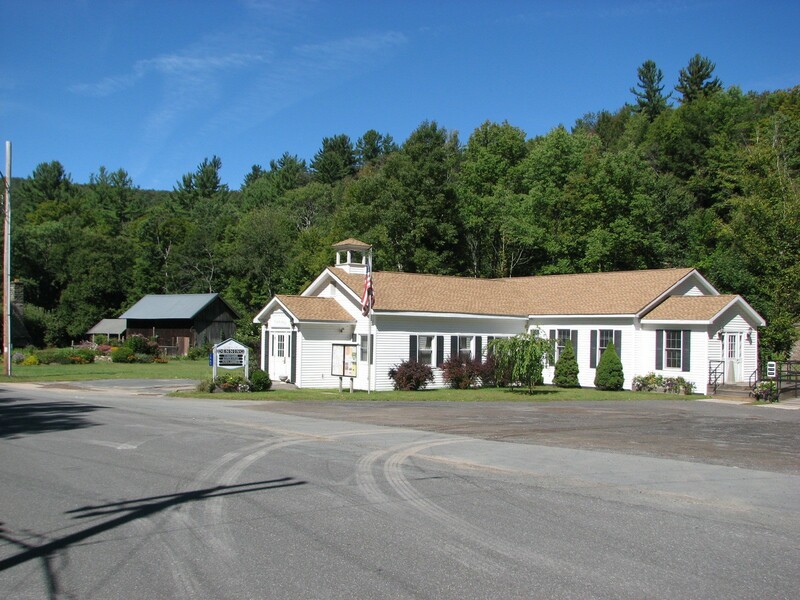 We crossed over the bridge and passed the Town of Denning town hall (mile 6.9 – 11:47 am). 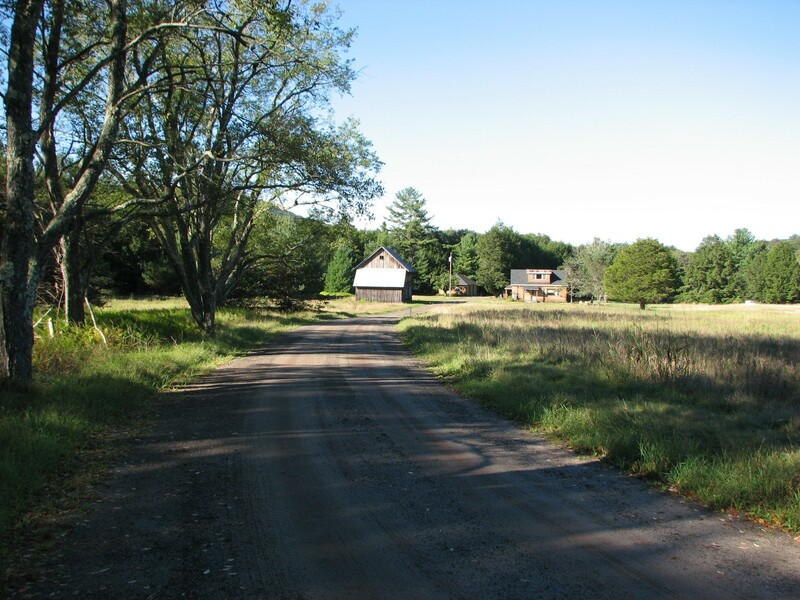 The road continued on through the small village of Claryville. We passed by a fire station with an historical marker indicating several key moments in history for the town of Denning. 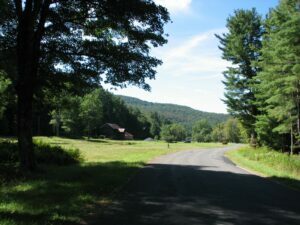 A little after noon we reached the intersection of Denning Road and West Branch Road (mile 8.1 – 12:10 pm) and turned onto West Branch Road, crossing over the Neversink river for the last time on our walk out to the turnaround point. The shoulder along the road was made of some sort of spongy material and had a nice give under our feet. We both thought that it would have made a nice running track surface. 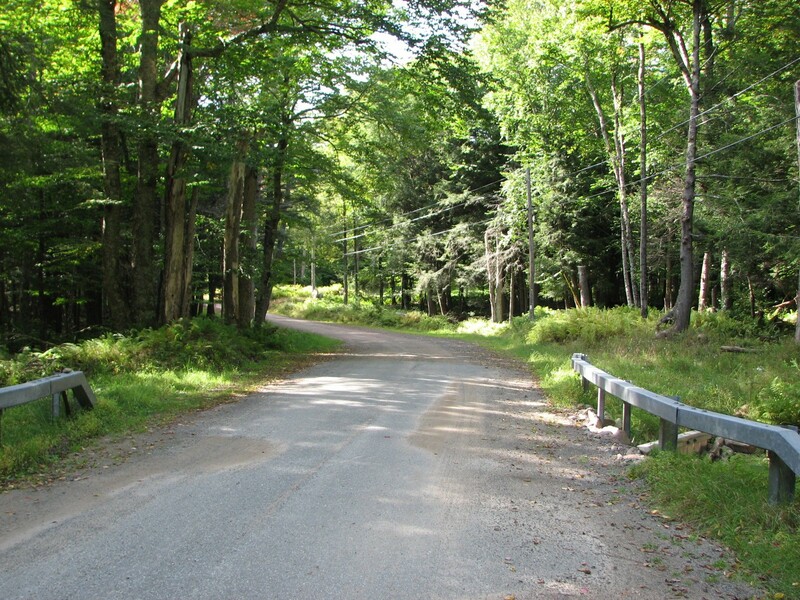 We arrived at our turnaround point, Pond Road (mile 9.5 – 12:36 pm). We took a few pictures before turning back and crossing to the other side of the road. There was a good rest spot between the road and stream that flowed alongside. We dropped our packs and decided it was a good time to eat some lunch. After finishing our lunch and taking a break we headed back down the road to Claryville. As we crossed the Claryville bridge (mile 10.8 – 1:31 pm) we met a couple heading the opposite direction. We chatted with them for a few minutes. They asked where we were from and when we told them Binghamton they said that their son was attending Binghamton University; what a small world. 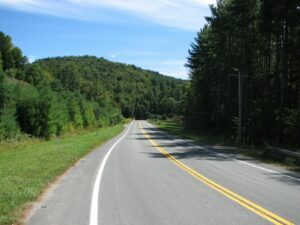 We continued on and turned left onto Denning Road heading back into Claryville. We passed back through Claryville and saw the remnants of a bygone age – an old phone booth. There was no longer a phone and it was slowly being overgrown by weeds. We passed by the Claryville Center, a cafe and some shops (mile 11.8 – 1:58 pm) and then on past the town hall and over the bridge. We still had a long way to walk before getting back to the car – It had taken us about 2.5 hours on our way out to reach this point. Our feet were starting to hurt and we were glad that we had chosen to wear sneakers instead of boots. The road continued to wind along, passing over the Neversink river a couple more times and finally the pavement gave way to dirt road (mile 18.1 – 4:01 pm). We finally arrived back at the car and dropped our packs (mile 19.0 – 4:18 pm). We took a short break before reluctantly pulling our boots on. Our feet were sore and we thought about just wearing sneakers on the trail, but we did not know what we would encounter on the trail. We did decide to leave our packs at the car; we would not need them for the short walk to the end. 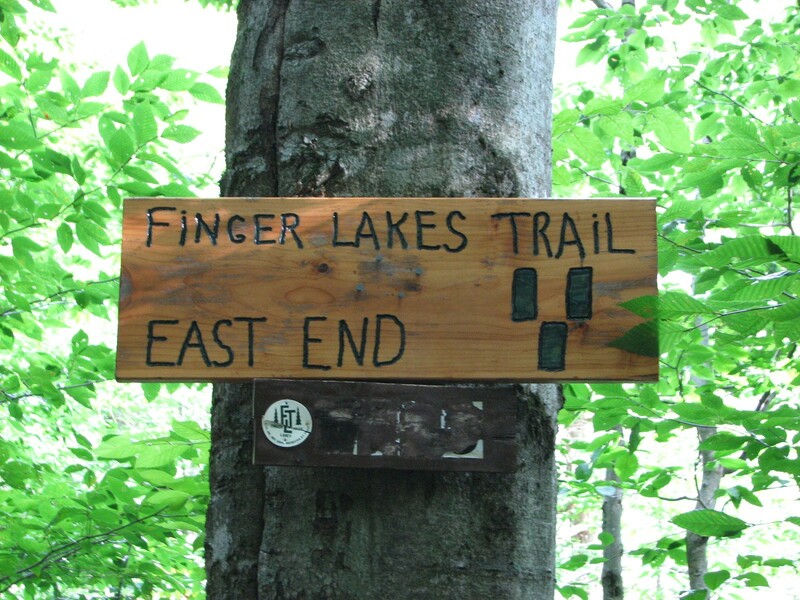 We headed up the trail to the Eastern Terminus; a short 1.3 miles on an easy trail. The sky was beginning to cloud up now and the sun was filtered and not quite as warm as it had been. After crossing a little wooden bridge over a small stream we arrived at the FLT Eastern Terminus marker (mile 20.3 – 4:59 pm). We took the required pictures and then started back to the car. We arrived back at the car about 40 minutes later and happily traded our boots for sandals (mile 21.6 – 5:39 pm). We had a long drive home, but we had done it. We had reached the eastern end of the FLT.